Product code: ES7490 Categories: Art Deco, Art Deco Pendant. So elegant and refined, there is no doubt that this Art Deco diamond pendant made in France in the 1920’s will always be admired for its elegance and style and will suit being worn for any occasion. Hand made in 18ct white gold and platinum in France in the 1920’s, this elegant pendant measures 8.8mm wide by 26.2mm from the bottom to the very top of the bail. In the centre is a lovely marquise cut diamond that measures 0.58 carats and accentuates the design of the pendant so well. The way it has been set apart from the border shows the thought that went into making this pendant. Then the border itself is set with twenty two rose cut diamonds that like the centre diamond have a millgrain finish to the setting. This millgrain finish can be seen as the elegant crimping along the edge of the setting which was popular during the Art Deco period and elevates this pendant so well. And then on the bail at the top which has just been restored is set with a further three rose cut diamonds. The rose cut diamonds on the pendant and bail come together to total 0.20 carats and have all the charm of being one of the earliest cuts of diamonds in history. 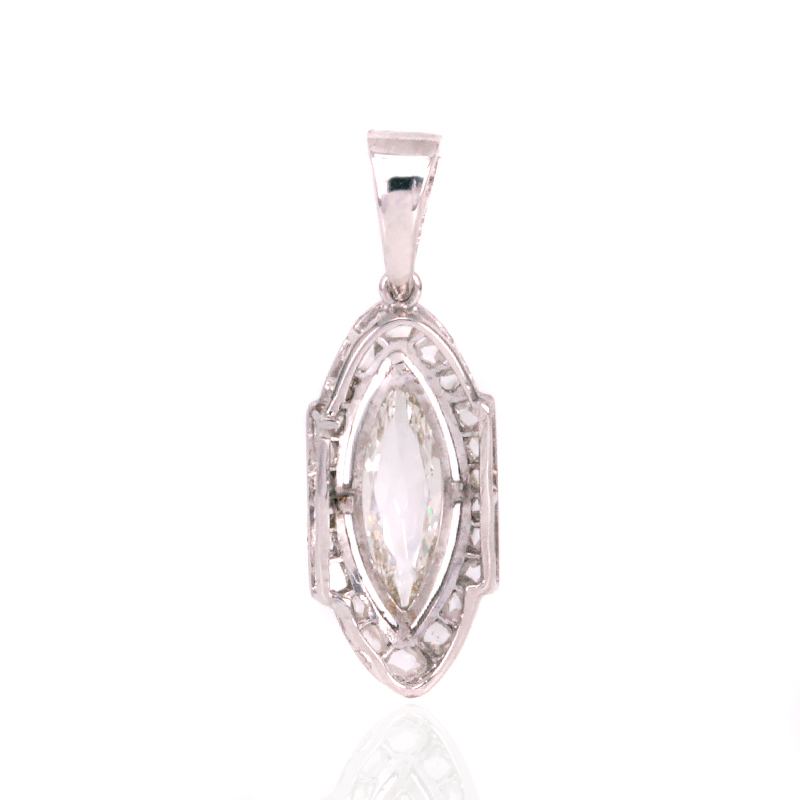 So elegant and refined,this Art Deco diamond pendant is just perfect for any woman for any time of the day or night. Tag: Art Deco diamond pendant.